Multicasting Digital Video At Michigan Tech | Visionary Solutions, Inc.
IPTV multicasting brings the frozen north to Internet2 Multicasting digital video at Michigan Tech Imagine watching students ironing the ice at midnight up in Houghton, Michigan, as they mold ice sculptures for the annual Winter Carnival. Or perhaps you’d be more interested in Michigan Tech no logical University’s ever-popular broomball seasons that have become a mid-winter tradition. These events and more could be streaming to campuses around the world, live and in living color, in the very near future as Michigan Tech and other universities equip their technology infrastructures with the ability to multicast broadcast-quality, real-time digital video. “Multicast is an important technology for us,” says Brenda Helminen, Director of Telecommunications at Michigan Tech. “You really can’t broadcast over the network without it. Multicasting is critical to optimize network usage, performance and reliability.” Unlike unicasting, which requires a separate signal for every destination, multicasting allows a source to send a single stream of data onto a multicast-enabled network to be picked up by multiple destinations, resulting in the use of far less bandwidth. Ten years ago, frustrated with the growing bottleneck on the public Internet, about 200 colleges, universities, and non profit research groups joined together to form their own network, Internet2 (or I2). This special-use network allows members to exchange research and information without having to deal with outside interests or time-consuming billing and bandwidth concerns. It is also multicast-enabled, which most of the public Internet is not. Member campuses connecting with Internet2 can choose to stream real-time, high-resolution video on a point-to-multipoint basis between their users and other I2 member users. 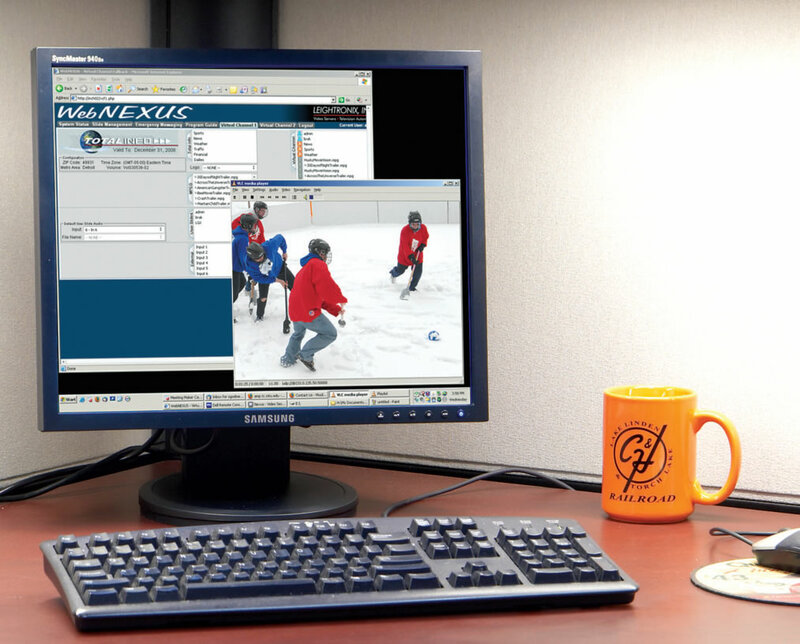 At Michigan Tech, video over IP encoders from Visionary Solutions, Inc. of Carpinteria, California are at the heart of the multicasting effort. Big picture The AVN210 doesn’t work alone at Michigan Tech. It is a slender black box, easily rack mountable, part of a larger system including a Leightronix Nexus video server. The Michigan Tech Nexus has one terabyte of disk space. It is used for everything from prerecorded events to slide shows, movies and radio station audio. Signals travel from the Nexus to an 8×8 matrix switcher and from there to a fiber link to the cable system head end. The Channel 2 signal, however, is also sent to the AVN210 video encoder and from there, out on the Internet and I2. 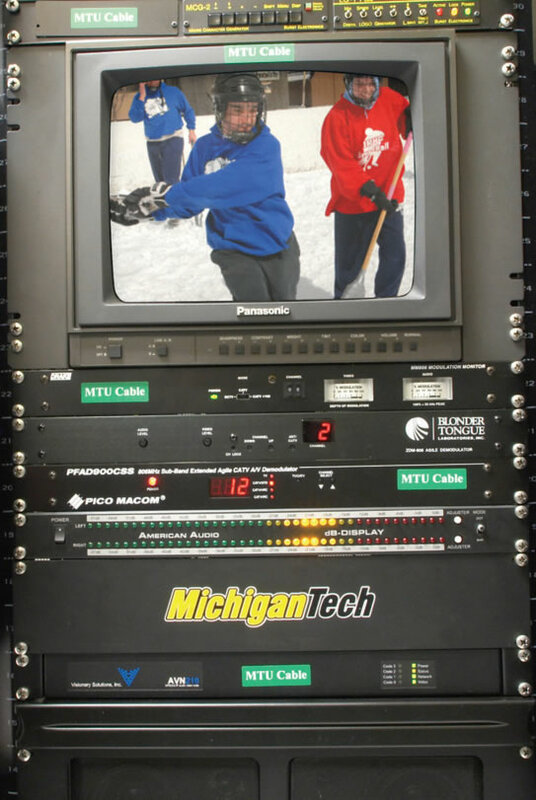 Michigan Tech does not have its own TV station, so in 2007 Godmere bought a second AVN210 from Visionary Solutions and placed it in a mobile rack that can be rolled around campus. It’s actually a dual-width rack with a video switcher, audio mixer, the AVN210 encoder, camera inputs, video preview monitors and other support equipment. 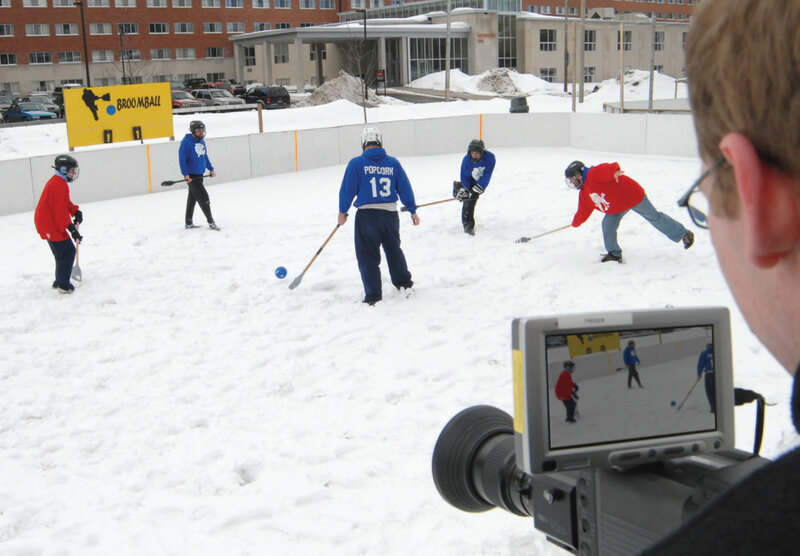 Student groups can borrow this portable “TV station” and multicast their live events, including broomball and student poker tournaments, simply by plugging into the campus IP network. The signal can be fed to the campus cable system, or picked up by any PC with decoder software or televisions equipped with an IPTV set top box decoder. Fast video messaging There has never been a more important time for instant communication across college campuses. At Michigan Tech, 30 student gathering places are equipped with television displays that distribute campus messages and announcements, along with subscription news and local weather from SCALA. The messaging system is managed by the school’s Education Technology Services Department. ETS also supports many AV technologies on campus including online learning studios, classroom technology systems, student cafeteria sound systems, and the University Division I ice arena. The messaging system, however, is showing its age and as TVs break down they are being replaced with professional grade LCD displays. ETS is also considering converting to an IPTV system using Visionary Solutions components. It would greatly expand the system’s reach at one third the cost estimated for necessary upgrades to the current analog system. “The biggest immediate advantage is that you can send a higher resolution signal out very cost effectively,” says David Chard, Senior Telecommunications Engineer for ETS. “The biggest roadblock that we have is to get the network infrastructure built out to all these hallways and gathering spaces where you wouldn’t normally supply networking.” Chard also likes the idea of being able to piggyback signals to change the channel or volume or even turn the TVs on or off. “Once we do the digital integration, we hope to improve access to the monitors for various kinds of messages.” Godmere, who maintains the current CATV system for ETS, is convinced IPTV is the way to go for the entire campus. “For the messaging system, we’re looking at a couple more Visionary AVN210 encoders and about 30 set top boxes,” says Godmere. “It might make sense to go beyond the current buildings—we would just need to order more STBs. That’s the advantage of multicasting. You send it once and who cares how many people see it? It’s going to get there.” Here to stay “When we first introduced our IPTV technology four years ago, some people weren’t sure if broadcast quality video on I2 was going to work” says Visionary President Will Bakewell. “But when you look at a stream coming from one of our boxes you’re really not aware that it’s compressed video. It’s great for live events and prerecorded material, even feature films. With IPTV multicasting the cost and pain threshold for high resolution video distribution has been dramatically lowered. Anyone on a multicast-enabled IP network like I2 (or most LANs or WANs) can easily and inexpensively become a video broadcaster.” Godmere says the AVN Encoders have proven themselves a professional, reliable, affordable solution over and over at Michigan Tech, and they have great plans for the future. So grab your computer, a hot cup of coffee and a comfortable chair, because it won’t be long before you can watch Michigan Tech students chopping, ironing, and sculpting their cool creations in the darkest hours before dawn when Winter Carnival returns to the cold, white north of the Upper Peninsula. 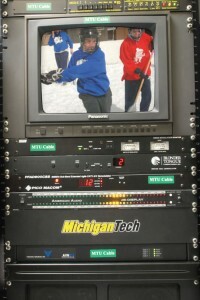 The multicasting setup brings Michigan Tech’s Channel 2 to I2 users all over the world ©2011 Visionary Solutions, Inc.